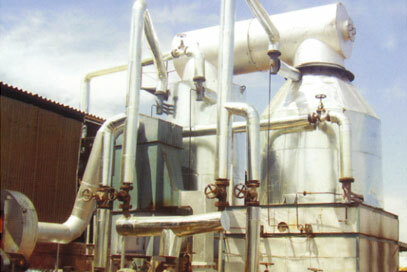 Hot Water Generator (HWG) specially for tea factories in Sri Lanka. To meet the growing need to modernise tea factories to produce quality tea at lowest cost, TIGL now offers the latest HWG taking care of complete heat requirement of tea processing from withering to drying. Our HWG's seamlessly fit on Conquest and Everest dryers and we offer complete turnkey services including design, supply and erection of energy efficient radiators, water pipe network and water treatment plant (if needed). HWG's specially suitable for large factories having more than 1 TPH of made tea production. Our service team in Sri Lanka will undertake the complete installation, commissioning and after sales service. The TIGL AQUARIUS system is forced circulation and fully automatic Hot Water Generator using forced circulation method. Hot water under pressure is circulated through in a closed loop through the heater and radiator where the heat is dissipated. The same hot water is recirculated through the coils for better heat utilization. The expansion and deaerator tanks ensure a pressureless and vapour free Aquarius system. The HWG gives temperature upto 150ºC in the dryer. Since these temperatures are achieved at very low pressures, the system is capital cost effective and easy to use and maintain. Heat exchanger coils are made using TATA boiler quality tubes and for the five pass model 2 sets of heat exchanger coils are used.